My question is, are you guys going to scan and translate the new special chapter of Dengeki Daisy that is out on Betsucomi? We don't have the raws. 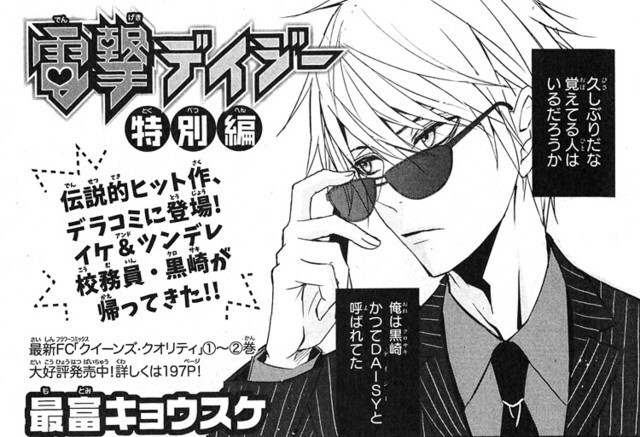 If someone could give us raws we could do it if one of our translators is interested. I did some digging and I guess DD won [something?] and got to have a special chapter in that magazine. I found the cover and a screenshot from what must be the chapter title page. It's the october issue right? We're working to release a chapter this month. Our translator for the series is usually quite busy so we only get scripts randomly when he's finished. It's also hard to translate and the fact that it's seinen doesn't make it any easier. You have to have a good grasp on Japanese to translate seinen plus having the different terms makes it quite challenging. Thanks for taking the time to answer, and so fast as well. Its good to hear there will be a new chapter so soon, honestly I'm just glad Kurosagi wasn't dropped all together as I am enjoy quite a bit and there really isn't anything else like it. Hello, I'm from polish team translating Btooom. I have trouble finding proper raws on public sites and I see yours are really nice. Will you be willing to share them with us? Of course we'll credit you back and stuff. recently, crimson flower dropped scanlations for "sabaku no harem". Being a big fan of the serie, I was wondering if you would be willing to pick it up. It would be my pleasure to help in any way I can to make this possible. Thank you for your time and efforts. I also already found some raws.